Lynden Air Cargo’s fleet of L382G aircraft now include fuel-efficient Microvanes that allow for energy savings as well as increased speed. Engineered by Lockheed and licensed to Metro Aerospace, the Microvanes are small aerodynamic components that are surface mounted to the aft fuselage, effectively reshaping the air flow around the cargo door and tail. They reduce total drag on the aircraft while reducing fuel and thrust requirements. The Microvanes are expected to result in fuel savings of up to 4 percent (up to 34,000 gallons of fuel saved per aircraft per year) depending on flight length on the Lynden fleet. "This project supports our ongoing efforts to support Lynden’s overall green initiative," says Ethan Bradford, head of Technical Services for Lynden Air Cargo. 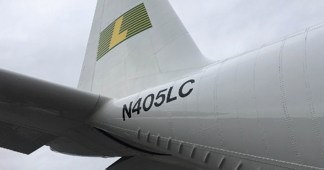 "We assisted Metro Aerospace to acquire FAA approval for installation and now we have the first set of Microvanes installed on N405LC. We hope to install them on the remaining fleet by the end of 2019." The first long-range mission to prove the effectiveness of the Microvanes was to Antarctica via Christchurch, New Zealand, to support an Italian research group. The Microvanes provide a margin of safety for these long flights. 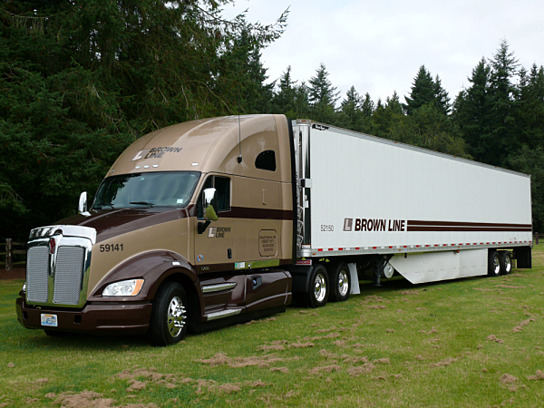 Brown Line, LLC, an industry leader in temperature-controlled truck transport, earned a SmartWay Transport Partner 'High Performer' Status ranking from the U.S. Environmental Protection Agency (EPA) this month. Among the hundreds of fleets partnering with the EPA through SmartWay, Brown Line is among the select few that have earned SmartWay High Performer status for all performance metrics. According to the SmartWay Transport Partnership, just over 2 percent of all SmartWay carriers operate fleets so clean and efficient that they make the High Performer list. "These companies are a step ahead in meeting the challenges of sustainable goods movement and have achieved significant shipping and freight efficiencies that merit special attention," says Gina McCarthy, EPA Administrator. "Compared to their SmartWay peers, High Performer carriers drive cleaner, emit fewer pollutants and burn less fuel for every mile they travel and for every ton of freight they move." Over the past seven years, Brown Line has decreased its idle hours by 87 percent, its Nitrogen Oxide (NOx) emissions by 43 percent, its Particulate Matter emissions (PM) by 52 percent and its Carbon Dioxide (CO2) emissions per ton mile by 27 percent. The company has also improved its mile per gallon (MPG) by 44 percent. "The Brown Line team is extremely proud of this award and this recognition. 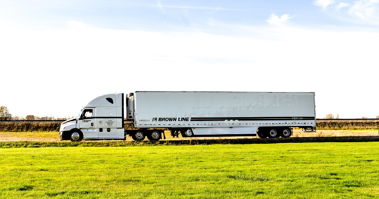 To be in the top 2 percent of all trucking companies is affirmation that our efforts to improve freight efficiency are paying off," says Brown Line President Bill Johansen. "We will continue to adopt programs and practices that improve productivity and reduce our carbon footprint on the road and in our operations." Cab design, with roof fairing, side skirts, integrated sleeper, and aerodynamic mirrors and bumper, reduces drag. 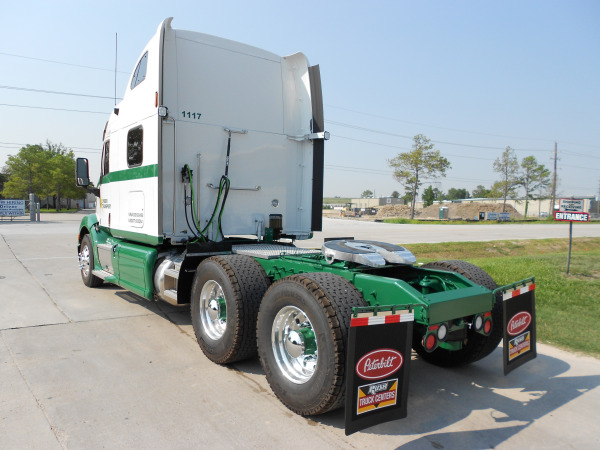 Ultra-lightweight 53' trailers use side skirts and trailer tails. 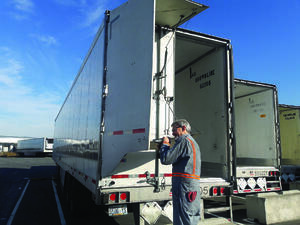 Fleet includes 53-foot trailers with California Air Resources Board (CARB) compliant reefer units. Team drivers and new high-efficiency plug-in electric refrigerated trailers minimize the need to idle the truck's engine. All reefers are electric. Efficient engines – DT-12 Transmission Program, Carb Emission Certification-Clean Idle. Gearing – DT-12, heavy duty 12-speed overdrive automated manual transmission increases miles per gallon. All trucks and trailers use wide-base, low-rolling resistant single tires and have an automatic system to keep tires properly inflated for optimum fuel economy and to reduce tire wear. PeopleNet tool is used to measure engine/driver performance in decreasing idle time and increasing miles per gallon with an average of 7.6 MPG for the entire fleet and an overall reduction in fuel use. Event Recorders are installed in all tractors to ensure improved safety and reduce cost. Brown Line became a SmartWay Transportation Partner in 2010. 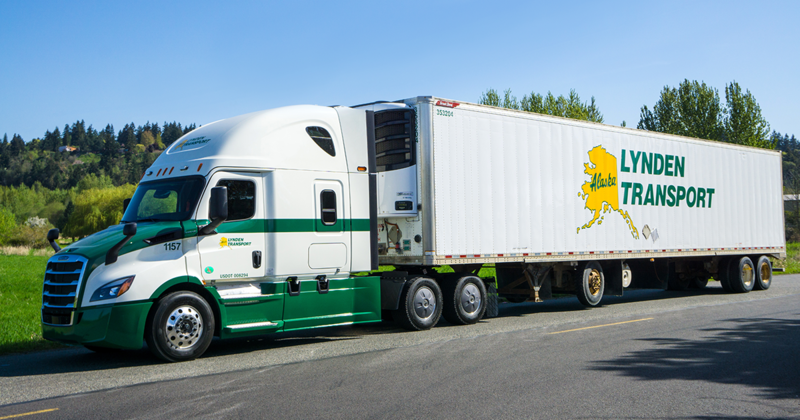 Sister company Lynden Transport became the first Alaska trucking company to join SmartWay in 2008, followed by LTI, Inc./Milky Way – a three-time winner of SmartWay's Excellence Award – and Alaska West Express in 2012. The EPA launched SmartWay in 2004 to help businesses improve the sustainability of their freight supply chains. Today, the partnership consists of 3,000 companies representing a cross section of the freight supply chain. Brown Line is one of the Lynden family of companies whose combined capabilities include: shipping to Alaska, truckload and less-than-truckload transportation, barge service to Hawaii and Alaska, charter barges, worldwide air and ocean forwarding, third-party logistics, trade show shipping, intermodal bulk chemical hauls, scheduled and chartered Hercules L-382 cargo aircraft and multi-modal logistics. Lynden companies are repeat winners in the annual Quest for Quality customer service awards presented by Logistics Management magazine. Alaska West Express is testing an on-board oil filtration system on six of its tractors that is allowing the company to operate even more clean and green. The trucks can now run as many as 145,000 miles between oil changes, eliminating around 56 oil changes and saving 657 gallons of oil. A six-micron filter removes debris from the oil and has a heating element to eliminate moisture. 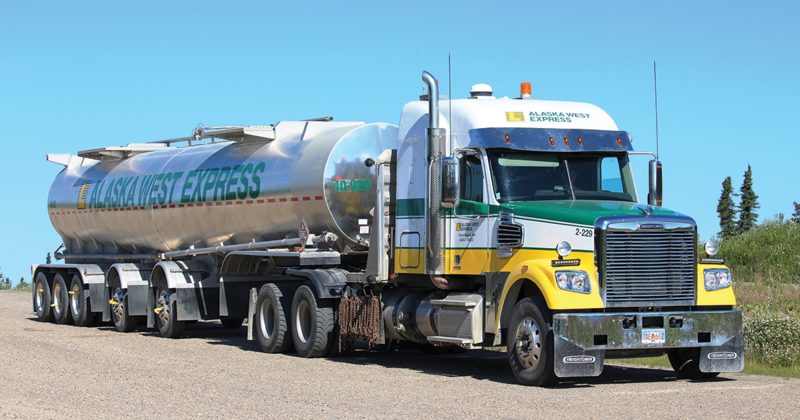 "The removal of moisture from the oil keeps the acidity of the oil in check and almost completely removes sludge," says Steve Nolan of Alaska West Express in Fairbanks. Rather than changing the oil every 25,000 miles, oil is tested and changed only when necessary which lowers maintenance costs. Alaska Marine Lines has been using similar units to filter hydraulic fluid and oil on its equipment. "These units require a change in thinking from routine oil changes to sampling and changing based on actual need," says Les Candee, Equipment Maintenance and Procurement Manager at Alaska Marine Lines. "It requires that sampling becomes part of the maintenance culture, as opposed to automatically draining and disposing of all fluids on a time-based program". These maintenance programs are part of Lynden's ongoing commitment to environmental stewardship. 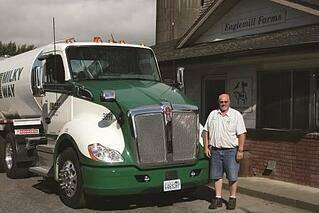 The Lynden companies are continually looking for ways to save fuel and operate more efficiently. Lynden's Equipment Team is testing new fuel-saving technology from aerodynamics to tires to idle-reduction equipment. Improving aerodynamics of tractors and trailers has great potential to save fuel. Brown Line can attribute at least 5 percent of its 25 percent fuel economy gains over the last three years to the use of trailer side skirts, and Lynden Transport has seen similar gains with side skirt tests in Edmonton, California, Texas and Alaska. "In theory, every 2 percent reduction in trailer drag results in a 1 percent fuel economy gain," says Lynden Tank Company General Manager Len Kilmer. 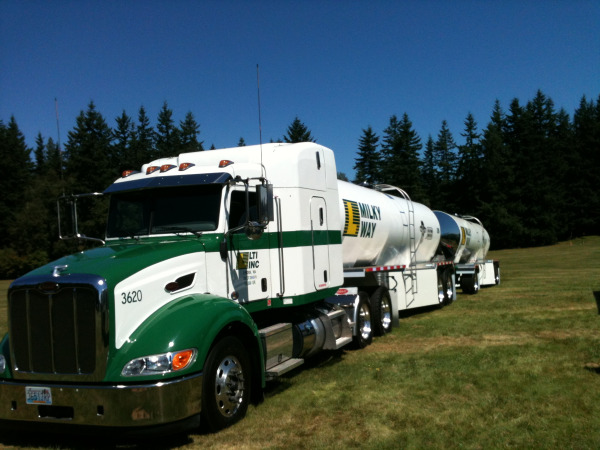 Last year, Lynden Tank worked with Western Washington University's Computational Fluid Dynamics program using digital drawings to simulate Milky Way tankers and identify areas to reduce drag. Lynden Tank is now developing the most cost-effective options that were identified with the computer model. Milky Way is also testing a prototype tanker to determine the actual benefits of side skirts, air flow tabs, and a new smooth seam on the tank (see photo). Experimenting with tires provides another opportunity to save fuel. Lynden Transport, Brown Line and Alaska West Express have been testing "super single" wide-base tires (pictured below). 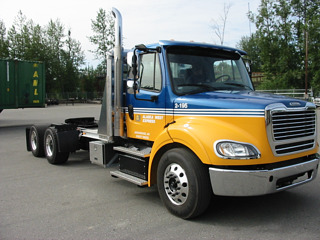 According to Charlie Mottern of Lynden Transport, the wide-base tires are lighter by about 1,000 pounds per 5-axle set. "They are giving us much better tire life at a slightly lower cost and better fuel economy than a typical set of doubles." Lynden companies are also testing automatic tire inflation systems that maintain proper tire pressure to optimize fuel economy and reduce tire wear. For the past three years, Alaska West Express has been testing auxiliary power units (APUs) on 13 of its units. The small generators provide electricity and heat to the cab and keep the engine warm. This allows the driver to shut down the engine during winter downtime rather than idling the truck's engine. They burn about one-quarter of the fuel as an idling truck and have so far saved Alaska West about 16,000 gallons of fuel and 25 oil changes. LTI, Inc. is currently running "head to head" testing on its Alexco ore haul between Seattle and Trail, B.C. Fuel and other operating costs are being carefully monitored and compared between Freightliner’s DD13 engine and Paccar’s MX engine. So far, data has been collected and analyzed for nearly 800 trips.